Photographers who love black and white imagery should consider the iPad among their editing options. For far less money than computer hardware/software, you can create outstanding monochrome and duotone images. Two of my favorite apps for this work are B&W Lab ($1.99) and Snapseed (free), which I cover in Chapter 3 of iPad for Digital Photographers. 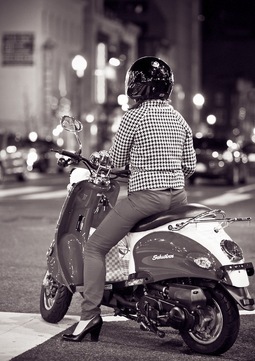 Woman on Scooter by Derrick Story, edited in B&W Lab on an iPad mini. Either app lets you import an image from your Camera Roll, Photo Stream, or any album on your iPad. Once the image is loaded, you can view variations via a collection of built-in presets. B&W Lab includes 15 presets and 5 film emulsions: Fuji Neopan, Ilford Pan, Kodak Tmax, Agfa, and Newpan. Snapseed features 6 presets. Each app allows you to fine tune the image with exposure controls, color filters, grain, and more. Once you've finished editing, save the B&W photo back to your Camera Roll or publish online. As I illustrate in iPad for Digital Photographers, serious artists can use these affordable tools to create compelling works. Open one of your favorite photographs in B&W Lab or Snapseed, and see what inspires you.